As we sit in our car, baking in the heat of Jakarta’s midday rush hour, our driver tells me that an average Jakartan spends 10 years of their life in traffic. It’s not hard to believe. As we slowly make our way across this sprawling megacity to meet Director of Surveillance and Health Quarantine, Dr Jane Soepardi, I observe how the sheer size and complexity of Indonesia’s capital city mirror the challenges facing the national immunisation programme. Indonesia is home to almost 250 million people, spread across an archipelago of more than 8,800 islands and three time zones. Almost five million children are born in Indonesia each year, yet one in five still misses out on the most essential vaccines. As a result, at least one million children remain under-immunised every year and as these numbers accumulate year after year, the risk of disease outbreaks such as diphtheria, pertussis and measles grows in proportion. These are highly infectious diseases that can kill children. These are typically children who suffer from multiple deprivations – they are generally poor, live in unsanitary conditions, have suboptimal nutrition and may not have access to good education. Not surprisingly they are at the highest risk of disease, disability and death and thus in dire need of protection of life saving vaccines. Anuradha speaks to Indonesian television about Gavi and immunisation (from 6:27). 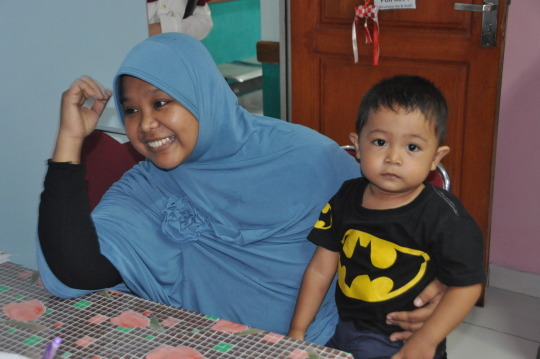 Gavi partners in Indonesia – WHO, World Bank and UNICEF – highlight the multiple challenges that prevent every child from having equal access to immunisation. Indonesia’s geography certainly doesn’t help. Some remote islands can be reached only once a month with medical services. However, it is intriguing that it can be just as difficult – and sometimes even more so – to reach children in the growing urban slums in Jakarta, a city whose population is expected to grow to over 40 million by 2040. And this is a phenomenon that needs new thinking and approaches. The rapid pace of urbanization, the mushrooming of highly dense slums and the near absence of organized primary health care in impoverished urban and peri-urban settlements are among factors that may result in cesspools of disease threatening health security. By 2050, 64% of population in Asia and 54% of Africa’s population would live in cities calling for urgent attention and contextualized strategies to provide basic health care including immunisation services to the urban poor. When we finally reach the offices of Indonesia’s Department of Surveillance and Health Quarantine, Dr Jane greets us with helpings of delicious Indonesian cuisine. She has dedicated most of her life’s work to immunising children, and it’s clear that her passion is highly motivating for others. During the meeting and the media interaction, we talk frankly about her country’s achievements in immunisation but also the persisting challenge of inequity and lack of introduction of important vaccines which several poorer countries have successfully introduced around the globe. Indonesia’s state-owned vaccine manufacturer has become a major global supplier producing vaccines that protect children in over 100 other countries. The national pride is palpable but even more heartening is the growing recognition that delay in indigenous production must not hold up introduction of new vaccines in their public health program. A very welcome development indeed as protecting the lives and health of children is urgent business that brooks no delay. As the country steps up its effort to expand the national insurance scheme, it is vigorously exploring opportunities to prevent illness and reduce hospitalization costs. And what better investment in prevention than the vaccines where every dollar invested fetches a return of 44 dollars by way of broader social and economic benefits! I take this opportunity to highlight the value of introducing Rota, PCV and HPV which can help avert diarrhea, pneumonia and cervical cancer and related costs. Nearly 34 000 children die every year in Indonesia because of diarrhea and pneumonia alone, the two main killers of children globally. Mother and her child wait to be vaccinated at an Indonesian clinic. Photo: Indonesian Ministry of Health. Together, we discuss the upcoming measles-rubella vaccination campaign, which aims to immunise around 70 million Indonesian children under 15 years of age. It will be one of the largest vaccination campaigns in history, and Dr Jane’s team are under a great deal of pressure. Vaccinators must reach at least 95% of all children for the risks of congenital rubella syndrome (CRS) to be effectively contained. Despite the many challenges they face, they are already thinking outside of the box. In my role here at Gavi I often hear the criticism that vertical, disease-focused vaccination campaigns can derail routine immunisation. While the scale of the required logistics can place a strain on routine resources, I do believe there’s an exciting opportunity for what I call “horizontal” campaigns, which deliver a range of vaccines and other health interventions together. With over one million newborn children in Indonesia missing out on vaccines annually, we urgently need to detect pockets of under-immunised children growing across the country and use the upcoming campaign to “catch them” with all other vaccines that they missed. I discuss these ideas with Dr Jane and together we brainstorm how this enormous vaccination effort that Indonesia is about to launch can add value and help reach children with even more vaccines. I am impressed with how quickly Jane and her team bring these up in the meeting with Indonesia’s Minister of Health and am delighted to be able to add my voice in support. As I say goodbye to Dr Jane, I’m struck by the vital role that individual leadership and commitment play in moving a country’s immunisation efforts forward.